Yesterday a story made the rounds on the internet after an airport spokeswomen said that an American Airlines flight had to be cancelled and passengers has to leave the plane after a passenger ‘passed gas’. American has now corrected the story through one of their own spokespeople that the real reason for the incident was in fact due a maintenance issue and ‘an odor’ without specifying the source of it. What causes a spokesperson to come up with the statement that such a case was caused by a passenger farting in the cabin is anyone’s guess. The News&Observer (access here) reported how the whole story came together. Reports Sunday that a passenger “passed gas” and forced a plane to be evacuated at Raleigh-Durham International Airport are untrue, according to American Airlines. What is true is that American flight 1927 from Charlotte to RDU arrived at the gate 2:21 p.m. Sunday, according to airline spokeswoman Lakesha Brown. There was an odor in the cabin that bothered some on board, but it was caused by a mechanical issue, not a passenger with a stomach issue, Brown said. 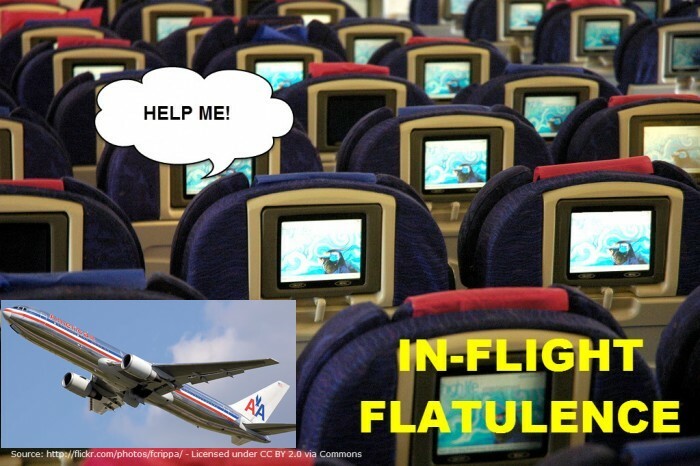 While this might have been a false alarm maybe some of you can remember the story last year where a flight attendant received a ‘help me’ note from a passenger due do someone in the cabin ‘releasing air’ frequently (see our previous article here). American actually waited quite some time to rectify the story, not timely enough to prevent it from being reported inaccurately around the world. Not sure why they took their sweet time to put out a statement correcting the airport representatives version of events.